Land of Black Ice: This is the first place I think of when you mention the color black on the Darlene Flanaess map. Is the ice literally black or blue-black or transparent showing off stone below? Does it absorb heat or repel it? I have too many physics questions about this place. For more on the Land of Black Ice check out my most recent article on cold places mentioned above. Blackmoor: Naturally next to the black ice is the grim-colored Blackmoor. While it might not be Dave Arneson's original Blackmoor, the Blackmoor we get in the World of Greyhawk is an homage that includes the same gloomy environment, the castle of Blackmoor, the mysterious City of the Gods and the even more mysterious villain Egg of Coot. Want to spice up your Blackmoor or heck play the Mystara version? Go to Havard's Blackmoor Blog. Azure Sea: The biggest and boldest blue on the map is naturally the Azure Sea. Azure according to Wikipedia is bright blue, like the color of the sky on a clear day. I'm no expert on physics, but perhaps this means the Azure Sea is more clear and calm than say the Solnor Ocean or the warmer Drawmij Ocean? I'd love to hear theories because I know on Earth, there is a difference in our oceans and seas. Blue: No I'm not being facetious, there is a town called Blue on the east coast of the Pomarj. Why is it called Blue you ask? Good question. I really don't know at the moment. I do know it's been a fisherman and pirate haven for centuries and most recently it's now a port in control of the Slave Lords or Turrosh Mak's Orcish Empire or both? Whatever the case, Blue is a nice rough port to stop at for PCs who want to get in some roguish trouble. Gold County: So gold is yellow of course, but where is the Gold County you may be asking? It's a southern part of Furyondy along the Velverdyva River bordering Verbobonc and Dyvers. In other words it's safe, quiet and wealthy while up north they are battling Iuz 24-7. Not only do the nobles love hiding out here, with their gold, there is also an abundance of sunflowers on the plains. Yellow indeed. White Fanged Bay: White immediately gives you the impression of cold. Set along the Icy Sea, this is a frozen coast noteworthy for its walruses and seals. Ivory and fur can be had by any enterprising barbarian willing to trek to White Fanged Bay. With that much food in a crowded area, what's the chances there's white dragons as well? White Plume Mountain: Speaking of white in the north, there is one iconic location that is not cold, but rather a volcano. White Plume Mountain, the home of Keraptis the wizard, is the destination of many a treasure seeker wishing to recover the lost magic weapons that were stolen away to this dungeon. You can find a version of this module online for just about any edition of D&D imaginable. Good luck! City of Greyhawk: Naturally, the city that started it all would be named for a color. Growing up I would always spell the color gray, grey because I'm a D&D nerd. I definitely know Grayhawk would look weird to me. The City of Greyhawk may be nicknamed the Gem of the Flanaess but I believe the name of the town does indeed come from a species of hawk living in the area. I also suspect Gygax chose grey for the name of his famous campaign, because gray is a neutral color, much like the free city itself is neutral politically. It is also centrally located on the map, in a neutral position from all the law and chaos swirling around it. Perfection. Grayflood River: A tributary of the Thelly River, this gray-sounding river is what forms the boundary between the South Province (Ahlissa) and the Iron League member state of Sunndi. One can imagine, in more peaceful times this was a decent river to cross and trade. Nowadays with the Great Kingdom ruled by mad-men and undead, the Grayflood sounds as dismal as its name. Silverwood: This tiny forest within the Duchy of Ulek is just what you imagine it might be from the metallic sound of its name. It's a primeval wood, out of bounds for mere men and inhabited by sylvan elves, unicorns, treants and other fey creatures. Ironically there is no actual silver here, but the inhabitants value their trees more than silver! Iron Hills: By now you're thinking, yeah the World of Grey-hawk has a lot of gray in it. The Iron Hills is yet one more, this one is though is known for its dwarven clans, indeed the place is actually the Kingdom of the Iron Hills. Given it's proximity to the city of Irongate and it being an ally of the Iron League, you can see a theme here. Irongate: As mentioned before, there's also Irongate, another grayish metal themed place and what I imagine as Minas Tirith from Lord of the Rings, but on the coast. This city (ruled by a dragon some say) has never been conquered, not by a thousand Aerdian nobles, nor the sneak attacks of the Scarlet Brotherhood. Want a good aligned place to start a campaign, especially with dwarves and gnomes? Try Irongate! Scarlet Brotherhood: Another great example of a color capturing the mood of a name. This remote peninsula region isn't the name for a nation per se, but rather a semi-secret, evil organization led by dangerous Suel monks and assassins. Unlike the Red Wizards of Thay in Forgotten Realms, if they were called the Red Brotherhood, they wouldn't sound half as sinister would they? (hmm Red Monks of Ilshar?) The Scarlet Brotherhood source book is all you need to get in order to know all the inner workings of this power group. Highly recommended. Redspan: This red-colored city is in the Duchy of Tenh. What I know about it is mainly from the book, Iuz the Evil. This fortified town used to protect the duchy from the Bandit Kingdoms, but it couldn't withstand Iuz's forces. DMs looking for a contentious city on the edge of war in all directions could give Redspan a look. Redhand: One more red themed place for you is Redhand. This is the bandit principality that touches on the Nyr Dyv coast including the town of Alhaster. It might be heretical to the fine folks who worked on the Bandit Kingdoms for Living Greyhawk, but if you want easy accessed info on Redhand, check out 3.5 Edition Age of Worms AP by Paizo in the pages of Dungeon Magazine. I seriously cannot find a purplish place in the Flanaess. Unless you want to count "Mauve" Castle which is ridiculous because that's a sorry misrepresentation of Maure Castle from the novel Saga of Old City. Greenreach: Well I'm quite stunned by how hard it is for me to find places named for shades of green in Greyhawk. Greenreach, an Iuz town near the Vesve Forest is one. As you can imagine, it's a staging area for the demigod's attacks to the west. Listen up heroes, someday you may very well have to raze Greenreach before tackling the big names in the Land of Iuz. Celadon Forest: Celadon is a shade of green, kind of like jade color. The great Celadon Forest is in between the Duchy of Urnst and Nyrond. It's an old forest, home to sylvan creatures, elves, good woodsmen, rangers and so-forth. It's a wonderfully green base of operations for nature-oriented characters. Copperstead: Yup, orange is just as hard as you'd think to find. Copper is an orangish metallic color though and coincidentally the village of Copperstead lies within the aforementioned Celadon Forest! This tiny hamlet is the HQ for the little-known Defender of Celadon.a group of woodland freedom fighters trying to repel a brutal local baron. Gamboge Forest: Oh that sneaky Gygax, he almost got this shade of orange past me. Gamboge is a saffron like color like the robes used by Buddhist monks. The Gamboge Forest therefore must be orangish right? Well unfortunately, there is no mention of this, but maybe in the Fall the leaves here are very orange in color? Not surprisingly this a home to sylvan elves, halflings, gnomes and the like, caught between the political drama of Nyrond and the Pale. Sounds like a cool place to visit. Sepia Uplands: The shade of sepia is a (reddish) brown color of course. The Sepia Uplands sound like they must be as monochromatic as the sepia photos we remember from history. It's an hilly region along Lake Quag, mainly controlled by Perrenland, but also bordering the Wolf Nomads and extending into the Vesve. Quite picturesque! Bronzeblood Haunt: Bronze is a brownish color right? Metallics are hard to judge. At any rate, this eerie ruined castle is found within the lawful and good Kingdom of Furyondy. Want a cool place to send players without the need for a long trip? Try this place. For more info, check out this article on Furyondy. Sablewood: Sable is actually a very dark brown, going on black. I couldn't decide which entry to place it, so I made it last. The Sablewood is in the extreme NE of the Thillonrian Peninsula in Cruskii. The fir trees in this wood of course are valued for their deep (black) color when treated. The barbarians love sable wood so much they don't export it! According to the Trees of the Flanaess section in the boxed set (yes Gygax loved tree-lore, don't judge), sablewood branches make excellent arrow shafts. Now you know where the "black arrow" comes from. Phew! That's it! I'm sure I missed some obscure color-coordinated place in Greyhawk. If I did chime in and let me know. Until next time! On colourful connections, the Sword of Kas. In protoindoeuropean Kas means Grey. Sword of Grey. Greyhawk, greyflood, greymere... a definate connection. Wonderful connection Sean. Would've never guessed. Happy accident or another sly Gygaxism? Who can say what was in Gary's mind. The man wrote poetry to diplomacy gaming zines before inventing D&D. Many people consider bronze to be a reddish color, but red and brown aren't all that far removed. There's Schwartzenbruin up in Perrenland, which sort of means "black bear", or more literally "black brown (one)". Bone is used as a color-word for "the whitish color of bone", so Bone March could be counted a colorful place, as it were. Faoladh! Genius! Duh, I wish I had caught Schwartzenbruin. DUH! And Bone March, well that's a bigger miss for me because I used to paint minis with bone white all the time. Good catch sir! 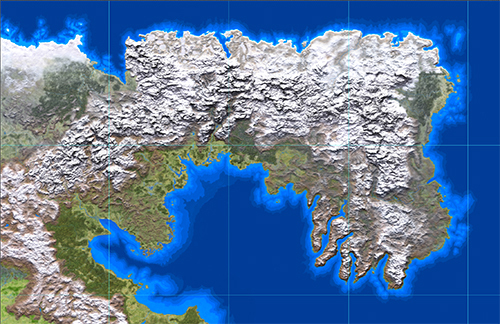 Less convincingly, there's Oldred on the north shore of Relmor Bay and Winetha on the coast north of the Gull Cliffs. I'm more likely to break them up as ol-dred and win-etha, but a case might be made for old-red and wine-tha. Hahaha, I did think of Oldred, wasn't buying it. Winetha though, I wish cause purple is a hard color to bring to this discussion. If it had vineyards that would be perfect.